A new technique for the decontamination of organs before transplantation using ultraviolet and red light irradiation has been developed by Brazilian and Canadian researchers and is described in an article titled "Inactivating hepatitis C virus in donor lungs using light therapies during normothermic ex vivo lung perfusion," published in the journal Nature Communications. The research was partially conducted at the Optics and Photonics Research Center (CEPOF), hosted by the University of São Paulo (USP) at São Carlos in São Paulo State (Brazil). "This biophotonic technique is revolutionary, as it helps avoid the transmission of diseases during organ transplantation," said Vanderlei Bagnato, full professor at the University of São Paulo, director of its São Carlos Physics Institute (IFSC-USP), and principal investigator for CEPOF. Bagnato's group partnered with researchers at the University of Toronto in Canada, which has the world's largest lung transplantation program, having performed 197 such surgeries in 2018 alone. According to thoracic surgeon Marcelo Cypel, who heads the service, the number of transplants could be higher if organs could be decontaminated, especially when the prospective donor has a chronic viral infection such as hepatitis C.
"Ten patients have so far been tested [using the biophotonic therapy]," Cypel said. "The new technique significantly reduced transplant organ viral load in eight of these patients. The procedure all but eliminated the virus in two others." The method described in the article involves ultraviolet and red light irradiation to reduce viral and bacterial loads in infected organs to prevent the transmission of diseases such as hepatitis to transplant recipients. According to Bagnato, the technique was initially developed to treat lungs, but is being adapted for livers and kidneys. "This should greatly improve postoperative conditions for transplant recipients," he said. "It will also enable us to use organs that we must currently reject because of the level of contamination." Lungs are decontaminated before transplantation by replacing blood with a preservation liquid in a procedure known as perfusion that was developed in Canada by Cypel. "Perfusion reduces the viral and bacterial loads, but cannot eliminate them completely. As a result, the patient has to be treated with antibiotics and antivirals for three months after the transplant," Cypel explained. "Thinking about ways to further reduce or eliminate the viral load in organs for transplantation, specifically hepatitis C virus, I considered the possibility of using ultraviolet light decontamination methods, which are commonly employed to decontaminate blood, for example. So about four years ago, we began partnering with Bagnato and his team at São Carlos. He and his colleagues came over to visit us and study the technique. Only a month later, they sent us the first prototype of the ultraviolet irradiation decontamination machine." "The biophotonic decontamination technique developed at our São Carlos laboratory consists of two specific procedures performed concurrently," said Cristina Kurachi, a professor at IFSC-USP and a participant in the project. During perfusion, while the liquid circulates in the lung to be transplanted, clinicians add molecules to the lung tissue, and biophotonic decontamination takes place directly in the organ through irradiation with red light with a wavelength of 660 nanometers (nm) until photodynamic oxidation eliminates the microorganisms in the tissue. "The ultraviolet irradiation directly destroys microorganisms by breaking down the molecules present in bacteria and viruses. The bacteria are killed, and the viruses are completely inactivated. Red light irradiation decontaminates indirectly via photosensitization," Kurachi said. "The perfusion solution is special and very expensive," Bagnato said. "It's made in such a way as to preserve the organ. Because of the cost, as little as possible is used in the procedure. Thanks to the technique and equipment we've developed, a liter of the perfusate can be flushed through the organ hundreds of times to remove the contaminants completely." 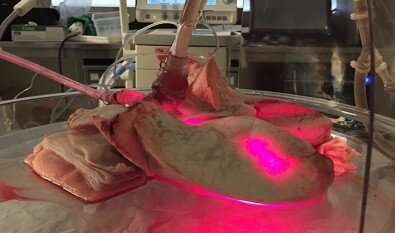 The method was first tested on human lungs rejected for transplantation to determine whether the tissue viral load could be reduced by irradiation. According to Cypel, the viral load was found to have fallen drastically after the procedure. "The next step was to subject pig lungs to the same procedure and then transplant them to see if the procedure caused any biochemical or morphological damage to tissue. It did not," Cypel said. Finally, the technique was tested on patients. "In the first ten transplants we performed, the new technique eliminated hepatitis C virus from organs donated to two patients. In the other eight patients, viral load fell sharply after surgery but rose again seven days later, and the patients had to be given antiviral treatment for three months," he said. "An important finding was that when the virus wasn't eliminated it reappeared in the patient's lab tests after seven days. With this information, we've since performed two other transplants where antiviral treatment concentrated in the first week after the operation. The virus was eliminated in both cases," Cypel said. According to Bagnato, this biophotonic therapy will be refined to assure even sharper reductions in the viral and bacterial loads, increasing the chances of successful transplants. "Our aim is to have light-based therapy eliminate all viral and bacterial contaminants in organs to be transplanted. If so, it may even be possible to do without the perfusate," he said. "All this has only been possible thanks to the philosophy introduced by FAPESP's RIDC program, which encouraged us to collaborate internationally and at the same time produce practically relevant knowledge," Bagnato said.